I went around the supermarket with a serious mission. This was Italian countryside. I was as far away from an Indian spice shop as an Eskimo in the Sahara desert. Before I left I stuffed the desert island essentials of chilli powder, turmeric powder and asafoetida into my suitcase, mentally reminding myself never to make fun of travelling aunties again. Four days I baked by the pool. Contemplating my big Tuscan curry effort, while our friends took it in turns to cook meals. Soon it was mine. I found fennel seeds, cumin seeds, garlic and a pack plastered with the word “organic lentils” on it. So far so good. But no ginger. This was a serious blow. But I ploughed ahead anyway. Hubby was tasked with chopping, washing and creating innovative implements to grind spices. Friends were banished from the kitchen unless collecting wine. 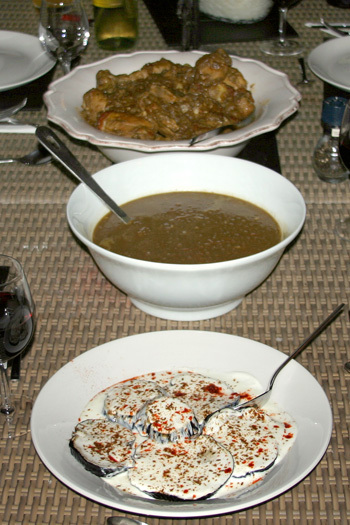 I focused on making Moong dal-esque dal, Aubergine Raita and Pepper Chicken Curry. In the stress of it all, I forgot rice. Sure enough, there was a large jar supplied in the villa. Of the well known Risotto family. Did I mention I was in Italy? The meal was a success, despite the missing ginger and soggy rice. Which goes to show that if you care enough, you can always have a curry. Well done Mallika! 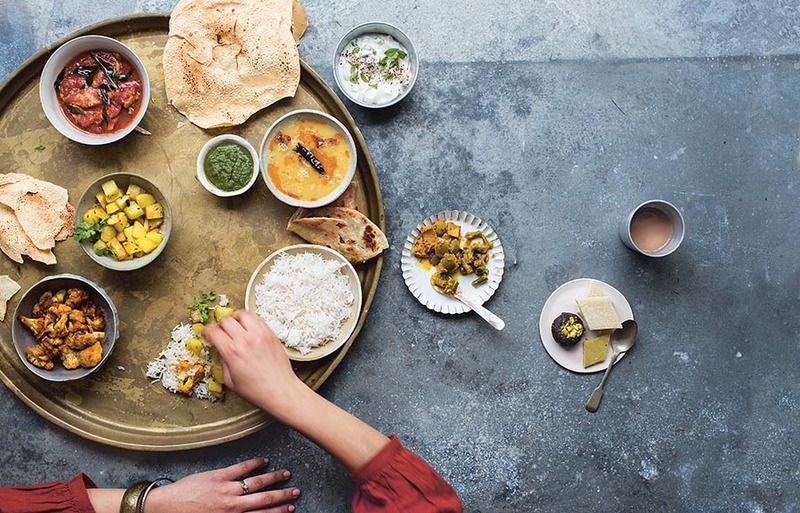 That could be a fab TV show… How to cook Indian food in Italy! yah! You made it..good going! Desi khana in Tuscany…kya baat hai! What is the first dish, the white one? Mental note to myself… always carry masala! Heck, I made curry pasta, so what’s wrong with curry risotto? Sounds perfect to me! Hope you are having a great time! Sounds glorious! the part ‘mentally reminding myself never to make fun of travelling aunties again’ made me smile. @sra the white dish is probably dahi-..uh something. I can’t figure out what those things topped with the dahi are. Hi Sra – that’s the aubergine raita. It was the biggest hit of the evening! You are such a trooper!And you’ve done fabulously given you were in unfamiliar settings.